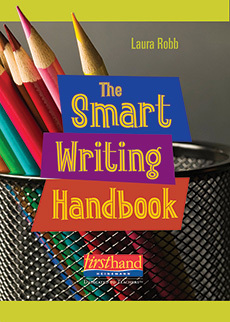 Laura Robb's Smart Writing series offers practical writing units that are uncommonly attuned to middle school writers' social and developmental needs. 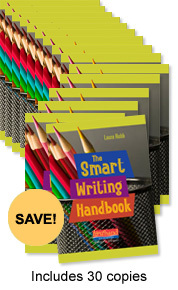 Providing the language and lessons she has honed over 45 years in the classroom, Robb's eight units of study helps to craft writing instruction that: taps into adolescents' desire for responsibility, relationships, and choice; guides students step by step through the writing of memoirs, short, short stories and persuasive, analytical, informative, and compare/contrast essays and free choice writing; aligns with the Common Core's writing genres; includes engaging, age-appropriate mentor texts; and is assessment driven and incorporates self and peer evaluations. 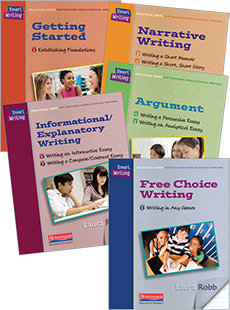 This Heinemann Curricular Resource includes 5 lesson books that lay out 8 units of study with 4–6 weeks of lessons, instruction and mentor texts. 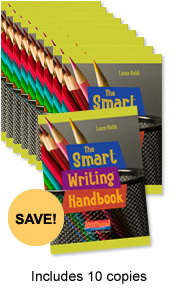 The series also includes: a teacher's guide from Laura which offers practical tips for using mentor texts, shows how the units fit into a variety of schedules, and explains the benefits of developing writing criteria for teachers and students; a CD-ROM offers print and video resources including mentor texts, criteria charts, evaluation forms, and student handouts; and a compact Smart Writing Handbook that reinforces important lessons and offers tips, rules, and guidelines for students writing on their own.